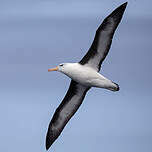 Larger than a gannet, the black-browed albatross is a massive bird wth a wingspan that can reach 2.5 meters. The wings a long and thin and black (their central underwing is white), the tail is black and short and the back is black. The rest of the bird is white. There is a small black mask around the eyes reminiscent of a brow. The bill is yellow, with a hooked red tip. The nostrils are tubular. 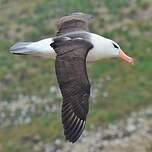 Outside the breeding period, the black-browed albatross is only found at sea. It only visits land to breed. 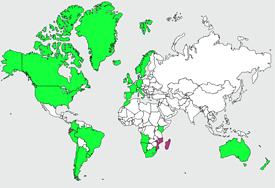 Colonies are often found on islands. Adults can live up to a few decades. 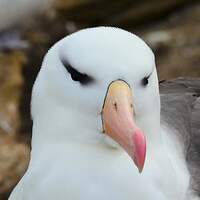 Like all Procellariiformes, the black-browed albatross has a desalination gland that allow it to assimilate seawater, the excess salt being excreted near the nostrils. It readily follows trawlers, looking for discards and offal. This is an issue for those birds as they can get caught by longlines and drown. This is especially true of females leaving the nest to go fishing, sometimes hundreds of miles from the colony. 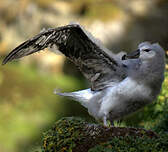 For example, nest female in the Kerguelen islands go feed in southern Africa where longlines abound. Twelve other speceis are threatened by current fishing practices. 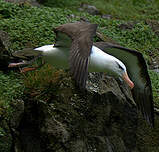 The black-browed albatross is perfectly adapted to flying. The wing design allow it to withstand the worst weather conditions. The long thin wings give the bird strength and flexibility in flight. 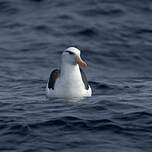 Black-browed albatrosses excel at gliding and fly very low, just above the waves. This species eats fish as well as offal and discards from fishing boats. The nest of this species is a small mound of soil topped by a shallow bowl where a single egg is laid. In some exceptional cases, the nest can be a meter high. Incubation lasts 71 days and both parents take turns. 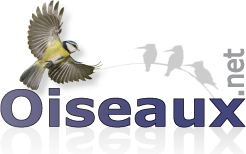 Colonies, ideally placed in the most exposed area of islands, can harbour a few tens of thousands of birds (e.g. the Falkland Islands, off Cape Horn). Chicks are protected by a thick grey down. Young birds are able to fly after 4 to 5 months. 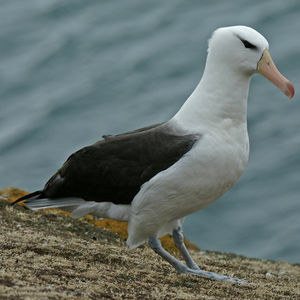 The black-browed albatross is a pelagic species that is found in the Southern Hemisphere. 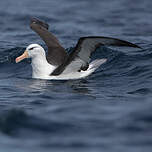 Occasionaly occurs in France and Europe (but it is the most frequently observed albatross species). 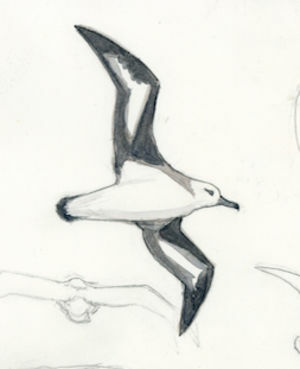 All observations of this species in Europe (vagrants) were at sea. The global population is estimated at 600,000 individuals. 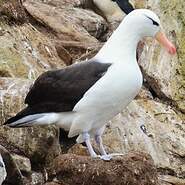 It is the most widespread and abundant albatross species. 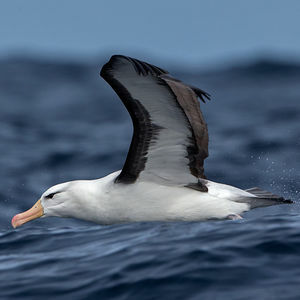 However, its survival is threatened at medium term by current fishing practices both in terms of prey availability and incidental killing of albatrosses. 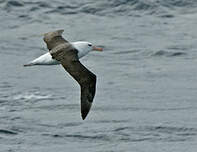 An estimated 40,000 albatrosses are accidentally killed each year as they interact with fishing vessels.